Every day that passes us by brings us closer to the future. We’re practically in a Cyberpunk future already, except everything instead of cool datajacks and elves and dwarves and orks hanging out in biker gangs while Shaman and Mages call down spirits in the streets, a server out in Burbank somewhere knows exactly when you’re likely to be hungry and how to specifically target you i order to get you to impulse buy some goods off of Amazon. There is a lack of Bug Spirits though, so I suppose that’s pretty good. Either way, it’s time to get out your very best mirrored sunglasses, make sure your datajack is nice and clean, and double check that you’ve not confused your explosive rounds with your gel rounds. Again. Because this week, we’re diving in and exploring the Sixth World. Careful not to get lost in the shadows in between megacorporations, omae, we’ll be running pretty deep there. 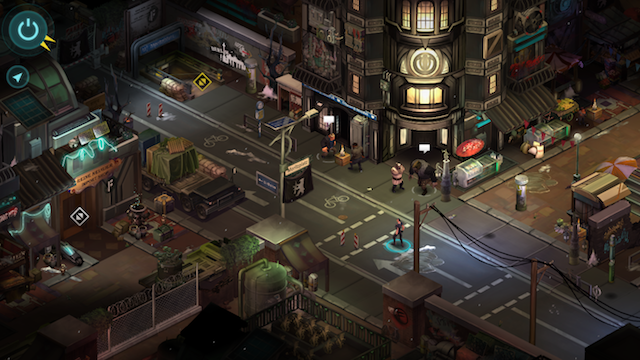 The Sixth (or Awakened) World is the world of Shadowrun. 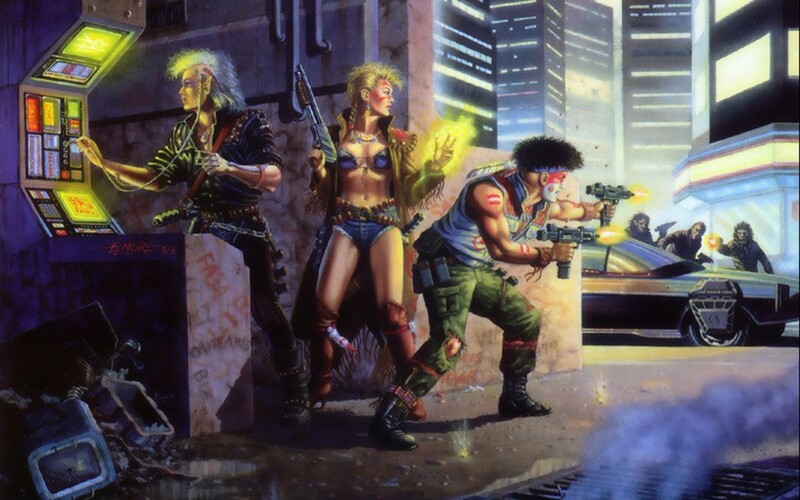 Originally published through FASA in 1989, Shadowrun was a fantastic setting that combined elements of high fantasy (like elves and dwarves and magic) with high-tech advancements made in a world just around the corner from our own. The result is a setting where you are just as likely to run into an Ork running at you with a magic sword, as you are an Ork running at you with a sawed-off shotgun. If this sounds amazing, that’s because it is. Shadowrun was the first setting I ever came across that combined magic and the modern world (if only I’d known then what I know now), and it did it in a way that seemed much cooler than any of the other systems that tried to do the same thing (I’m looking at you World of Darkness). Where World of Darkness made the fantastic elements stand apart and hidden from the world, Shadowrun mixed them in nice and easy. So sure, you had a secret elven nation that was full of magic and smuggery, but you also had elves who just got up and went to work and were middle-managers who were hoping that maybe today was the day someone would finally fix the coffee machine down on 12. 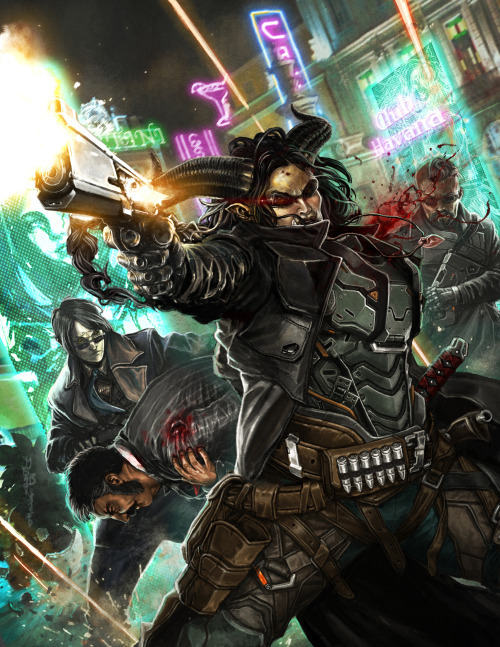 Shadowrun is deliciously cyberpunk flavored. It’s a near-future dystopian world where Corporations dominate the horizon (though they are not as all-powerful as you’d believe–interestingly, there are still sovereign nations who haven’t privatized every part of their governance), and in the cracks between the MegaCorps, in the shadows on the streets, the players survive and thrive. It’s a setting that inspires the gamut of stories from gang-members trying to make it big to slick high-tech assassins. And mixed up in all of that, you get Dragons and Spirits and Shamans coming back from the brink of death to try and stop the fiendish plans of the former two. That’s basically the plot of one of the greatest Shadowrun (and SNES) games of all time. That game does such a fine job of introducing the world. It follows the story of Jake Armitage, a shaman and shadowrunner who gets himself killed one evening because he’s come into possession of a program meant to take out a malevolent AI being protected by a sinister Megacorporation (and the dragon who has been behind all the schemes). If you have never played this game, you should go check it out. I mean just listen to the music–you can already feel the setting unfolding around you. So with that in mind, let’s dive in and take a look at just what makes the Awakened World tick. To begin with you have to understand a little of the history behind the current state of the world. At first things are trucking along as normal–until 2011 comes along and a young man named Daniel Howling Coyote (nee Coleman) begins leading mass breakouts from the Native American reservations/reeducation camps. Accompanying his protests are stories of strange occurrences. Bullets not hurting him, people with clear shots missing, walking through walls–the whole nine yards. Basically, people are seeing the first vestiges of Magic returned to the earth. Daniel Howling Coyote is marked for destiny, they say, and it seems so, because in his wake are a large number of followers. He puts together the Native American Nations (NAN), and in short order declares war on a country that has, in response, had their president sign an executive order legitamizing the extermination of native american tribes. In response, Howling Coyote organizes the Great Ghost Dance–a massive magical ritual which causes Mt. Ranier, St. Helens, Hood, and Adams to erupt simultaneously, proving incontrovertibly that magic had returned to the Earth. True facts, I’d love to play a game set during that time. Chaos follows. America admits defeat and following the Treaty of Denver, the NAN are recognized. 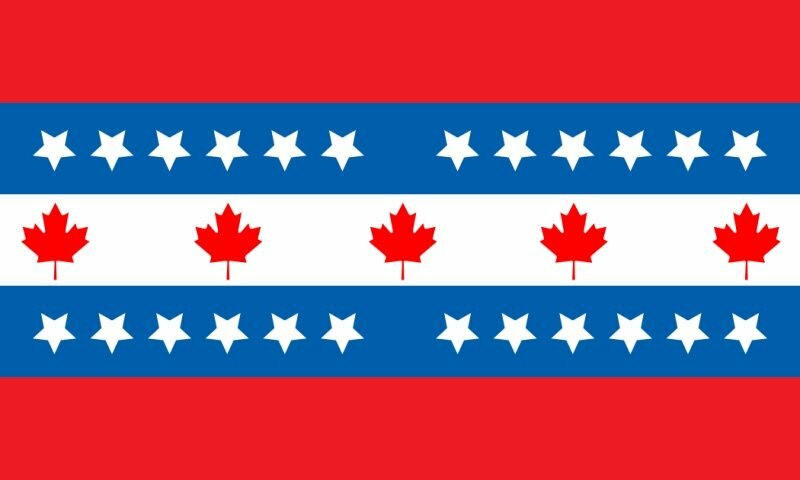 There’s a brief crisis in which America tears itself apart, leaving the United Canadian and American States (UCAS) and the Confederated American States (CAS). The last remnants of the Arrogant Worms did the national anthem. Nobody was sad. The NAN, meanwhile, made up of a number of nations including the Salish-Shidhe Council, the Siou Nation, the Pueblo Corporate Council, and the Ute Nation, take over vast swaths of North America. Magic returns even faster with mages and shamans appearing in all cultures. You get Aztlan in Central America (who are backed by Aztechnology, and who definitely never officially practive blood magic or human sacrifice or weird experiments with magic and cybertechnology and the recently deceased. In the midst of all of this, progress is still continuing its steady march forward, regardless of the reappearance of magic. Armies are fighting digitally now–hackers are a big part of any squad. And in 2029, there’s a massive attack on the computer systems of the world as something known only as The Crash Virus wends its way across the landscape. The Crash Virus caused untold billions of dollars worth of damage to economic infrastructure and to people who were connected (and who found themselves unable to log back out because of the Crash Virus and its ability to induce lethal levels of biofeedback in people. The virus was eventually contained by a strike team called Echo Mirage which sounds cool until you realize they were a team of spec-ops hackers. Then it just gets cooler. There are a few other massively important events along the way. A lone-eagle nuclear warhead gets launched at Russia (thanks to the Ghost Dance [yay ethically and morally complicated situations]), but then the missiles never make it to their target. They instead go missing and never turn up again. Go magic. Corporations win more and more legal battles, giving themselves the right to govern and a certain amount of extraterritoriality that just gets more and more expansive until some corporations have more than enough power to privatize their security forces and hire mercenaries–and that’s what basically puts the world spinning helplessly into the situation it’s in today. As we mentioned, the world is much like our own, only set in the dystopian near future. 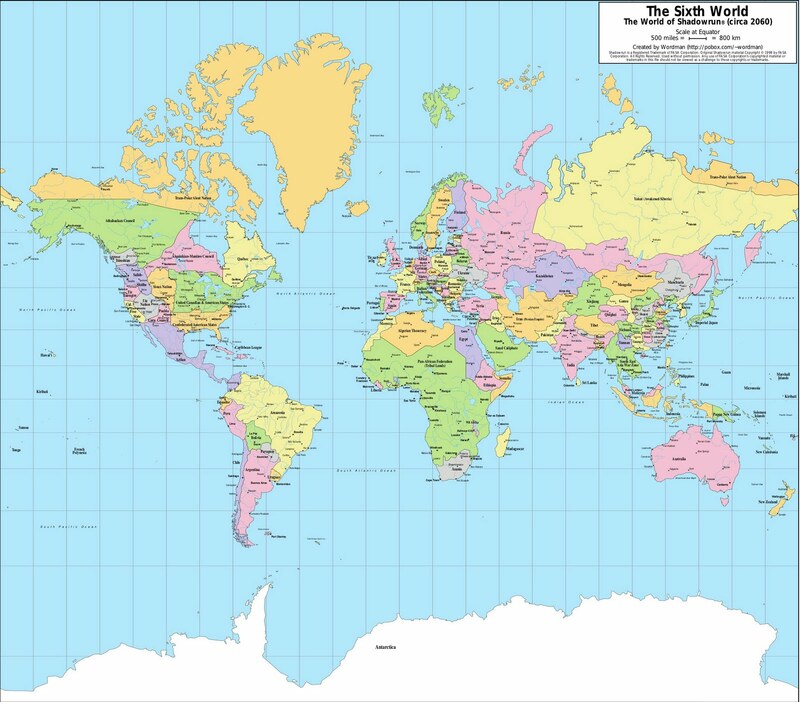 So while the continents may be recognizable the countries are different. Let’s start with North America because I am an imperialist stooge. North America is a nation divided. You have the UCAS and CAS on one side. The various members of NAN, as well as the Elven nation of Tir Tairngire make up the rest of North America. Of particular interest is Seattle, which is considered by many the default setting of Shadowrun. After all it’s where the vast majority of both games take place. It’s the place mentioned in every single core book. It’s a bastion of the UCAS in the middle of the NAN–so the whole thing has kind of a high-tech Casablanca feel to it. In Seattle you’ll find a representation of just about everything in the world. 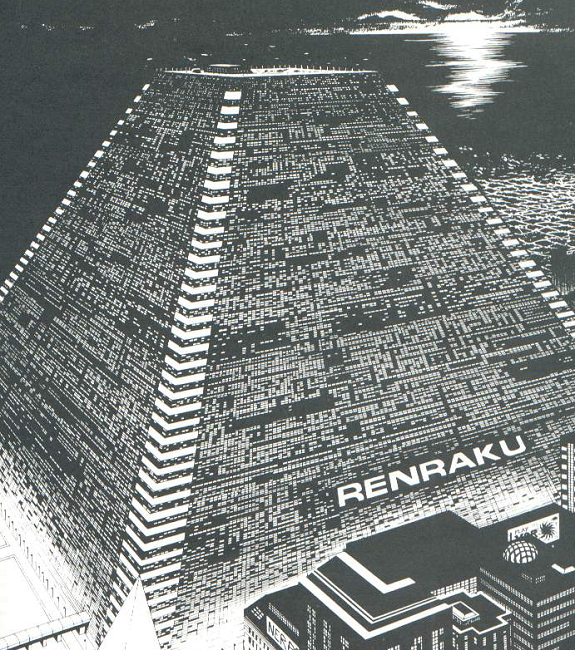 You’ve got every major megacorporation here, including Ares Macrotechnology (guns guns and more guns), Fuchiyama Cyber-Industries (at least until they get absorbed by others, but they make cyberdecks), and Renraku Computer Systems who have this big fancy arcology which is a landmark of modern Seattle. Absolutely nothing has gone wrong with this self-contained shopping mall/industrial complex/housing facility that was capable of supporting itself without any input from the outside world. It certainly didn’t get sealed off or become home to an insane AI. Germany is not having a great time. 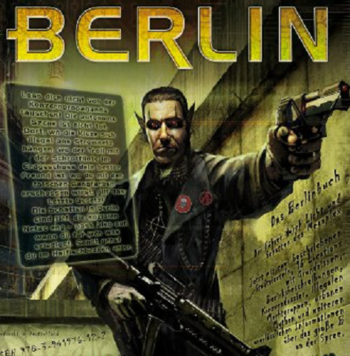 After a worldwide riot for bigotry known as the Night of Rage, an organization called the Anarchist Movement Berlin gains control of the city and they descend into anarchy and history repeats itself a little. The anger behind the populist movement gives way to a city divided into East and West Berlin, run by anarchists and corporations respectively. In the meantime, though you get the Berlin Flux State and Shadowrun Dragonfall, so y’know, they can do whatever they want. Meanwhile the United Kingdom is enjoying a sort of magical Rennaissance. Magical ley lines and standing stones (like Stonehenge) are reactivating and several of them seem to be in British control. The whole country gets a little more wild as they seem to be returning somewhat to their rules of newest people get all the support, and we’re definitely better than everyone else. Japan, meanwhile, has put together an Imperial State and is home to several major players in the corporate world. While little enough has changed here, it’s important to know that they are xenophobic and expansionist. Depending on which edition you’re playing in, they have a foothold in San Francisco, though the admiral there goes a little crazy and goes off script. And then of course there’s Russia and China. China has splintered, much like America. It has become a collection of dozens of splinter states that are all warring with each other. It began with a magical veil that settled over Tibet and parts of the Himalayas, which granted these regions their independence and emboldened other states to break as well. Accompany all of that with some good old fashioned civil war and the return of a number of great dragons, and you’ve got the recipe for a state in constant flux. As for Russia, they become more like conquerors. They invade Poland and Germany, and seem all set to pull a page from the Blitzkrieg playbook, when superior logistics and supply begin to win out (because history likes to repeat itself and has a sense of irony), and Russia is forced to cede some of their conquered territory. You’ll note that I’m talking a lot about countries here–which is an interesting thing in this setting in particular. 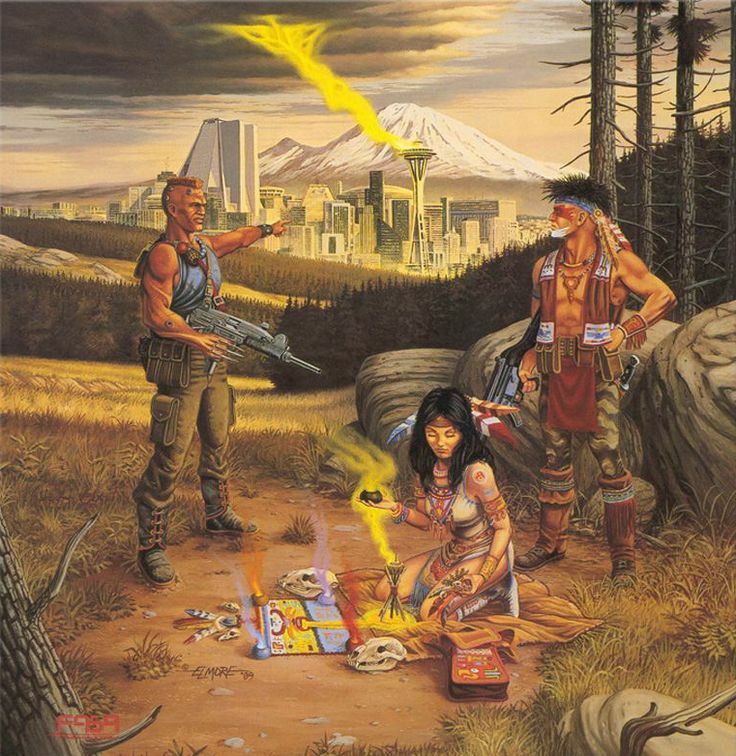 One of the big themes of Shadowrun is the emergence of new nations and governments and how they’re affected by all the crazy magic in the world, but also how they deal with interacting with the corporations. It’s an interesting change-over from many cyberpunk settings, where the government is basically nonexistent. Here it feels like national power is gutted, and corporations have their own solutions–there’s Lone Star and Knight Errant covering the role of police-officers/peacekeepers, for instance. But the FBI still exists. And is likely underfunded and basically a place for the dying embers of any kind of national service to take light. Which leads us to like the 5th or 6th estate (by this point in the world). Corporations (and their employees) are basically nation-states unto themselves. Although–they are still technically beholden to the law. Granted they’re probably setting their own laws in the Corporate Court, but it’s an interesting juxtaposition just the same. Which is why, even though the latest edition of the rules has some serious problems, Shadowrun will always have a place in my heart. The setting is fantastic no matter which end of the cyberpunk sliding scale you want to play on. 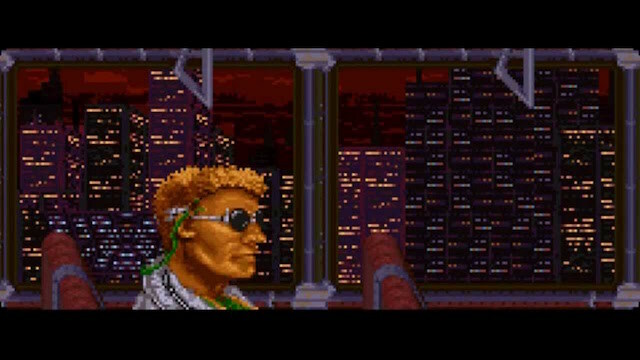 You can run pink-mohawk and minigun through the streets, or get super mirrorshaded up and try to be ultra slick. 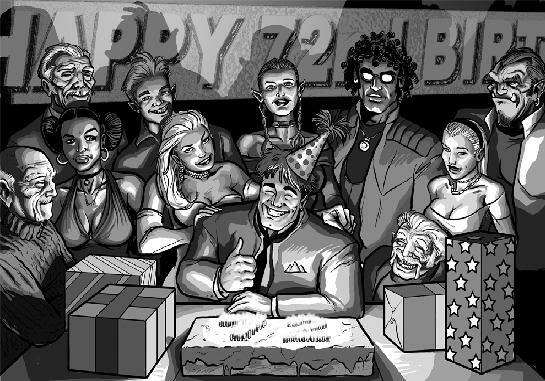 But the real secret to Shadowrun is that you can use it for some stealth social commentary pretty easily. Want to talk about race, or marginalized groups trying to find a place? It’s built right into the fiction. 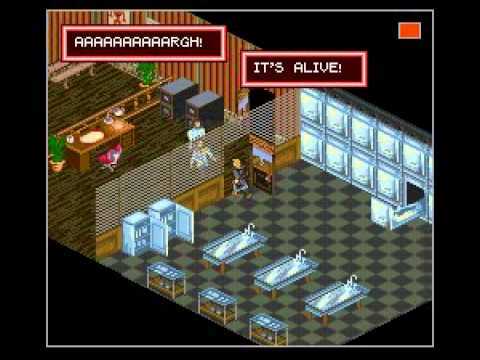 It can be a little touchy at times, but it’s nice to see themes like these considered in games–it had a big impact on me as I was growing up. I’m not saying it was the most deftly handled tool for discussing some of the complex and ugly realities of our world, but it started a conversation. Anyway, we’ve just barely scratched the surface of the Awakened World. We haven’t even begun to talk about Metaplanes (which are magical realities sideways to our own where powerful spirits and magic-users dwell. Nor have we covered the various cybernetic realms one could get lost in. I highly recommend picking up one of these books…because there’s really nothing else quite like Shadowrun. >> Of course, you can’t always trust everything you read in a big aggregate dump like this. If you really wanna know the whole story do a little digging and, as always, think for yourselves, chummers.